We had ONE THING planned for our entire two weeks in Italy. ONE THING…which was a cooking class. I received recommendations from heaps of friends - and no shame to them - but nothing was calling out to me, nothing was screaming “authentic AF.” Somehow I came across “Marina in Cucina” and felt the romance building quickly. I loved the idea of having this intimate dinner with her and a few others, nothing pressured or oversold. Just a solid five hours making pasta, drinking wine, all being taught by a whimsical personality. Marina made the recommendation of putting basil and tomatoes in table water. The basil for the taste and the tomatoes for a splash of color. Small savory cookies were places as snacks. 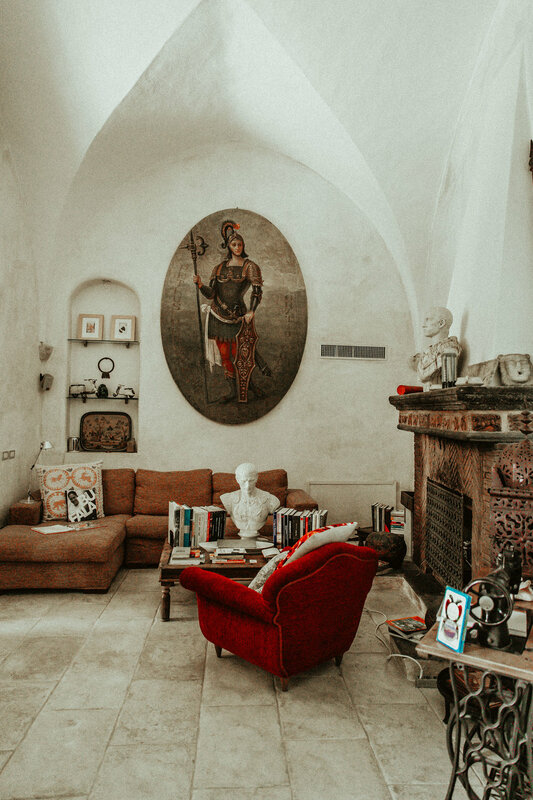 This home used to be a convent, but now rests in the hands of a beautiful, curly haired Italian chef, who runs her cooking classes from her kitchen. These high ceilings made me feel like royalty, especially the intricately carved, wooden dining chairs. Busts of warriors perched stoically on shelves and end tables. Sprinkles of modernized Italian knick knacks balanced the heaviness of historical collectibles. Despite the room being large for company, I felt more at ease knowing she could be spending very peaceful evenings in solitude, her bare feet propped up on the coffee table, reviewing a book with Cocles himself in the foreground of her reading. She was the epitome of my Italian dream. She wore bright, red stripes and thick red glasses to pair. There was no where I would have rather gone than at the gated doors of Villa Cocles. Um, he’s taken. For real tho - we engaged. We got to Marina’s a little early. Originally, Dave and I had planned for gelato, but we kept getting lost and at some point realized it might be too far of a walk. We opted out (as regretful as that was) and decided to awkwardly buzz the door for entry. I was heart-warmed by the greeting, our names shouted out as if we were old friends. To be fair, she slightly knew us from assisting over the phone with what to cook when Dave had food poisoning a few days ago (apparently add lemons to everything). Once the rest of our group arrived we were gifted aprons with hand-written Italian phrases on them. If you’re lucky they’re a little cheeky. We were taught how to whip together quick small bites for guests like olives with a pinch of spice and a whole lot of lemon! If the others weren’t there I wouldn’t have been hesitant to devour them all. She moved into the art of making pasta and shared a bit of history of how she grew up around it, like laying pieces across beds to dry out when she was a child. I wouldn’t mind having my bed filled with food - jus’ sayin’! A girl can dream…but apparently these weren’t dreams for her! 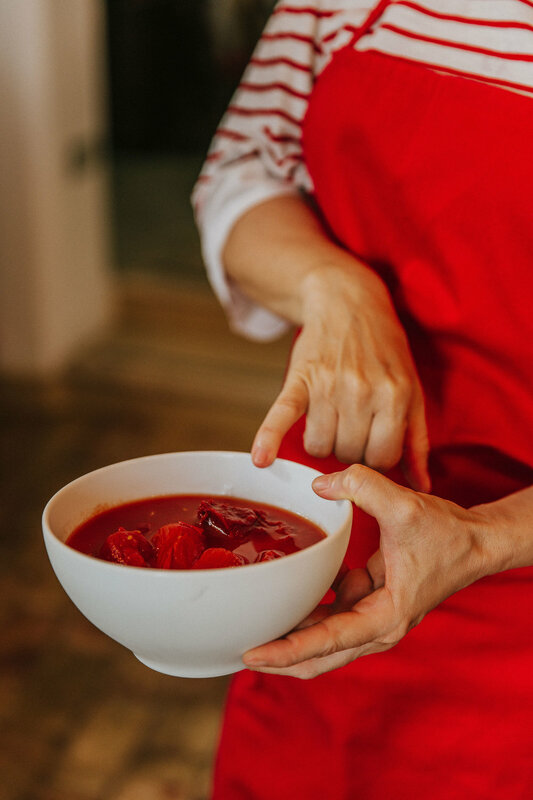 That reality created a foundation of appreciation for the time spent into cooking and the influences that have taught her what she practices today. I won’t share everything about the recipes themselves, because it would defeat the purpose of attending on your own, but I will mention that our pasta batch didn’t have eggs! Her point was to learn how to make pasta even if you’re just left with the staples in your cupboard. I’ve already tried making pasta at home and felt with a little more practice I’ll have friends hounding at the doors. She encouraged to add chopped parsley to the batch - it’s wonderful for some color! One thing that blew my mind was the sauce (something I believe I won’t get right until I have those tomatoes). She had chopped garlic, lemon and orange peels with dried oregano. These peels have been cured with salt in a large jar that sat on the edge of one of her counters. She stated she didn’t need to add salt to her sauce for this very reason. She cooked the tomatoes down to a paste, allowing the caramelization to add flavor when turning the edges into the middle. The water from the boiled pasta added liquid that was cooked out in the process. Genius I say! Starting the evening right with learning the difference between Spumante and Prosecco! Majority of our time was spent on the balcony. Whether it was rolling dough or smooshing tomatoes, we were in bliss looking out at the sea, the cascade of cement homes, and listening to the harp that was being strung across at a rooftop wedding reception. I was both envious and at peace with my surroundings. Please note that despite this being a cooking class, you are rarely cooking. You have moments where multiple hands are helpful, but this experience was more like having a private chef. Marina would scoot off once in a while to prepare the rest of our meal, which gave us optimal time to attempt small talk with our temporary company. Coincidentally, the couple who shared the table with us and their parents, had also gotten engaged. Dave and I smirked at each other and kept ours private. We started with a bread salad which was one of my favorite meals, mainly because our hosts back at the Airbnb used it as well, so there was a sense of familiarity. Marina mentioned that back during the War, the soldiers would carry bags of this hard bread (it was like biscotti and also twice-baked). It could hold up to about a year, which was great during those times of rationing and being on foot. All you had to do was run it under water and life would be breathed back into the loaf. We loved it so much we made sure to have it in our suitcase coming home. We also learned that green salads are normally eaten on the side of entrees versus eating them as an appetizer. Our pasta was served immediately after, which I wasn’t shy to keep scooping onto my plate. Nor was I shy when the chicken came out as well. Hell you’re paying for it, might as well dig in! I would encourage booking for the evening. You get to cook, eat, drink, and chat whilst seeing the sunset and feel the rolling breeze from the water. The table used to roll and cut pasta was beautifully painted, ceramic designs that become familiar and desirable by the end of your visit. Bread salad with basil, tomatoes, oranges, and onions. You have to soak the bread in water first! Chicken thighs which will be dressed with a sauce made from homemade limoncello. Once the evening ended after eating a ricotta based dessert, we lagged behind to speak with Marina. One thing Dave and I really enjoy whilst traveling is getting to know more deeply about the people who call whatever country we’re in, home. It’s important as humans that we don’t just trample around like cows, but to move like birds, pollinators, in the way that we collect and share so things can bloom and spread for others to enjoy its influences and abundance. That’s the sweetness of knowledge and experience.